T-Mobile had a very good year in 2013, and the company is letting everyone know about it. The Un-Carrier plans seem to have worked their magic for T-Mobile as the fourth place company announced this morning that it had seen a net gains of 4.4 million customers in 2013. Seeing as the company actually ended 2012 with a net loss of customers, you can definitely say that CEO John Legere's seemingly crazy Un-Carrier announcements sprinkled through out the year did their jobs, and did it well. While the number of net customer additions was definitely a positive for the overall year, the fourth quarter did contribute 1.6 million customers to that total, but came at a loss of $20 million dollars. Customer acquisition is never a cheap endeavor, and between trying to lure users from other carriers and expand its coverage, it was sure to happen. In theory, however, T-Mobile should more than make up that loss over the course of time from those new customers. Now comes the question of what T-Mobile can do to keep this momentum going. We've already seen the Un-Carrier branding carry over into this year with an event held at CES in January, so we won't be too surprised if there is more coming down the pike, but your guess is as good as ours as to what the company could possibly do next to continue shaking up the industry. BELLEVUE, Wash. – February 25, 2014 – T-Mobile US, Inc. (NYSE: TMUS) today reported fourth quarter and full year 2013 results demonstrating that its Un-carrier strategy is successfully delivering results. The Company has aggressively focused on eliminating customer pain points and is delivering continued growth in its total and branded customer base through the successful execution of this strategy. T-Mobile reported more than 1.6 million total net customer additions with 981,000 total branded net customer additions for the quarter, including branded postpaid net additions of 869,000 and branded prepaid net additions of 112,000. The strong branded postpaid net addition performance is the result of continued momentum in gross additions, which were up 15% quarter-over-quarter and 80% year-over-year, and the continuation of low branded postpaid churn, which was 1.7% in the quarter. For the full year 2013, on a pro forma combined basis, T-Mobile added more than 4.4 million total customers and more than 2 million branded postpaid customers. "Our performance in the fourth quarter and the full year is clearly proving that we have our strategy right and that we are executing it well," said John Legere, President and CEO of T-Mobile. "Customers are fed up with the old ways and are voting in favor of choice, innovation and doing business with a company that cares about them and is willing to earn their business. For shareholders, we transformed the Company into a fierce, growing competitor that is changing the wireless industry and creating significant value." On March 26, 2013, the Company announced its radically simplified unlimited "Simple Choice" service plan with no annual service contract. Device financing with the Equipment Installment Plan (EIP) provides customers with low out-of-pocket costs on some of the most popular devices available in the US wireless industry. On July 10, 2013, the Company unveiled JUMP! (TM), a groundbreaking approach to more frequent phone upgrades. 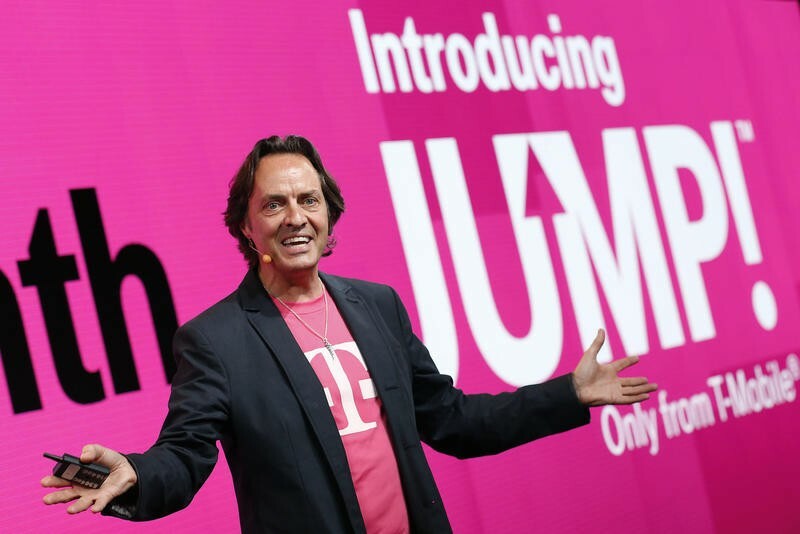 T-Mobile had more than 3.6 million customers enrolled in JUMP! at the end of the fourth quarter of 2013. On October 9, 2013, the Company announced that it would make "the world your network – at no extra charge" – with unlimited data and texting worldwide in 100+ countries for Simple Choice customers. At the same time, T-Mobile announced that it had delivered nationwide 4G LTE in 233 metro areas covering 202 million people. Since then, 4G LTE coverage has increased to 273 metro areas covering 209 million people. On October 23, 2013, the Company un-leashed tablets and revolutionized how customers buy and use tablets with free data for life. Customers receive 200 MB of free data every month with any tablet for as long as they own and use the device on T-Mobile's network. In the fourth quarter of 2013, T-Mobile had 69,000 mobile broadband branded postpaid net additions, principally composed of tablets, compared to 5,000 in the third quarter of 2013. On January 8, 2014, the Company announced that it would reimburse Early Termination Fees (ETFs) for individuals and families who make the switch to T-Mobile and trade in an eligible device. The plan also offers a trade-in value for customers' phones. In January 2014, the Company entered into agreements to purchase certain 700 MHz A-Block spectrum licenses from Verizon Wireless for approximately $2.4 billion in cash and the transfer of certain AWS and PCS spectrum licenses held by T-Mobile. Combined with the Company's existing Boston A-Block holdings, T-Mobile will have low-band spectrum covering approximately 158 million people, which will allow it to further improve the customer experience in major metro areas and boost in-building and breadth of network coverage. The transaction is expected to close in mid-2014. T-Mobile ended the fourth quarter of 2013 with approximately 46.7 million customers, an increase of 1.645 million total customers from the end of the third quarter of 2013. T-Mobile significantly grew its total branded customer base, with 981,000 net customer additions during the quarter. Branded postpaid net customer additions of 869,000, including 800,000 phone net additions, continued the strong momentum seen in the second and third quarters, reflecting continued low branded postpaid churn and significantly higher gross additions. The Company's network modernization program and strong execution of its Un-carrier strategy contributed to a continued low branded postpaid churn rate of approximately 1.7% for the fourth quarter of 2013, flat versus the third quarter of 2013 and an improvement of approximately 80 basis points from 2.5% in the fourth quarter of 2012. The branded prepaid business exhibited improved customer growth with 112,000 branded prepaid net customer additions in the fourth quarter of 2013. During the fourth quarter of 2013, the quality of T-Mobile's customer base and receivables portfolio continued to improve as a result of the Un-carrier strategy implementation and the effect of credit tightening over the past two years. 54% of EIP receivables were classified as Prime at the end of the fourth quarter of 2013, compared to 43% at the end of 2012. For the full year 2013, service bad debt expense was down 51% year-over-year. The Company's recent Un-carrier 4.0 launch has seen particularly strong uptake among the highest credit quality customers. Total revenues for the fourth quarter of 2013 increased by 39.1% year-over-year, principally due to the inclusion of MetroPCS results in the fourth quarter of 2013, and 10.2% compared to pro forma combined total revenues for the fourth quarter of 2012, primarily due to higher equipment sales revenues on record smartphone sales. Total smartphone sales, including sales to branded postpaid and prepaid customers, were a record 6.2 million units in the fourth quarter of 2013, equivalent to 91% of total units sold, up from 88% in the third quarter of 2013. This represents a penetration of 81% of the total branded customer base at the end of the fourth quarter of 2013, up from 78% at the end of the third quarter of 2013. On a sequential basis, total revenues increased by 2.1%, again principally due to higher equipment sales revenues on record smartphone sales. The portion of branded postpaid customers on Value or Simple Choice plans was 69% as of December 31, 2013, up from 61% as of September 30, 2013. Service revenues for the fourth quarter of 2013 grew by 25.2% year-over-year primarily due to the inclusion of MetroPCS results for the full quarter. Service revenues increased by 0.6% quarter-over-quarter primarily due to growth of the Company's customer base, offset in part by increased adoption of Value and Simple Choice plans, which have lower monthly service charges. Compared to pro forma combined service revenues for the fourth quarter of 2012, service revenues for the fourth quarter of 2013 declined 1.1% year-over-year. This represents a significant improvement compared to the third quarter of 2013 when service revenues declined by 4.6% year-over-year on a comparable basis. T-Mobile's service revenues have grown in each of the last three quarters on a sequential basis, reflecting the growth of the Company's customer base. Branded postpaid average revenue per user (ARPU) decreased quarter-over-quarter by $1.50 or 2.9% to $50.70, primarily as a result of the continued rapid adoption of Value and Simple Choice plans, which deliver lower monthly ARPU due to lower service charges compared to bundled equipment and service plans. Branded prepaid ARPU for the fourth quarter of 2013 increased by $0.13 or 0.4% to $35.84 compared to the third quarter of 2013. Adjusted EBITDA for the fourth quarter of 2013 was $1.239 billion, a 7.8% decline from the third quarter of 2013, reflecting strong customer growth and increased promotional expenditures. On a sequential basis, branded cost per gross addition (CPGA) rose by $10 to $317 reflecting increased promotional expenditures during the holiday season as well as higher equipment losses from growth in sales of higher priced smartphones. Branded cost per user (CPU) declined by $1 to $24 versus the third quarter of 2013 reflecting customer growth and ongoing strong cost control. In alignment with industry practice, Branded CPGA and Branded CPU will no longer be reported after the fourth quarter of 2013. Cash capital expenditures for the fourth quarter of 2013 were $882 million, down from $1.0 billion in the third quarter of 2013 and $898 million in the fourth quarter of 2012. Cash capital expenditures reflect T-Mobile's continued investment in network modernization and 4G LTE deployment. On a pro forma combined basis, the Company added more than 4.4 million total customers in 2013, including 2.4 million branded net customer additions, which consisted of more than 2 million branded postpaid customers and 359,000 branded prepaid customers. This compares to a loss of 256,000 total customers in 2012, including losses of more than 1.5 million branded customers, which consisted of 2.1 million branded postpaid customer losses and 548,000 branded prepaid customer additions. On a pro forma combined basis, total revenues increased by 5.3% year-over-year to $26.1 billion in 2013, while service revenues declined by 5.6% year-over-year to $20.5 billion in 2013, reflecting the shift from service revenues to equipment sales revenues driven by adoption of Value and Simple Choice plans. On a pro forma combined basis, Adjusted EBITDA declined by 16.9% to $5.3 billion in 2013, while the Adjusted EBITDA margin declined to 26% on a pro forma combined basis from 29% in 2012, reflecting the very significant customer growth the Company experienced in 2013. Cash capital expenditures increased by 13.2% to $4.2 billion on a pro forma combined basis due to the continued network modernization and 4G LTE deployment. T-Mobile has continued to make rapid progress on the expansion and integration of MetroPCS. On July 25, 2013, the Company announced the strategic expansion of the MetroPCS brand with the planned launch of 15 new geographic markets. On November 21, 2013 the Company launched the MetroPCS brand in 15 further markets, bringing the total of expansion markets to 30. The Company has opened more than 1,700 distribution points in these new markets as of December 31, 2013. The Company began selling T-Mobile-compatible devices to MetroPCS customers in the second quarter of 2013 through MetroPCS branded distribution points and has already transitioned approximately 3.5 million new and existing MetroPCS customers to the T-Mobile network. For the full year of 2014, T-Mobile expects Adjusted EBITDA to be in the range of $5.7 to $6.0 billion. Cash capital expenditures are expected to be in the range of $4.3 to $4.6 billion. With the success of our Simple Choice plan and the continued evolution of the Un-carrier strategy, branded postpaid net additions for 2014 are expected to be between 2 and 3 million. With this growth and rate plan migrations, the penetration of Value/Simple Choice plans in the branded postpaid base is projected to be between 85% and 90% by the end of 2014. Quarterly and Full Year Financial Results For more details on T-Mobile's fourth quarter and full year 2013 financial results, including its "Investor Quarterly" with detailed financial tables and the required non-GAAP reconciliations, please visit T-Mobile US, Inc.'s Investor Relations website at http://investor.T-Mobile.com. For comparison purposes, pro forma combined measures presented in this release include the combined results of T-Mobile USA and MetroPCS to reflect the business combination for the relevant periods. See Investor Quarterly for further details.